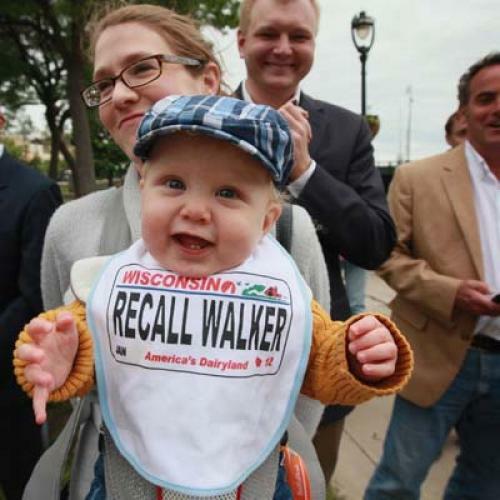 Pretty much all previews of Tuesday’s recall election in Wisconsin are framing it as a precursor of the November election, and declaring that a win for Scott Walker, the Republican incumbent who is up for recall, would necessarily bode terribly for Barack Obama in Wisconsin and beyond. I don’t buy it. And that goes the other way, too—I don’t think Democrats should take away too much optimism for their fall prospects if Milwaukee Mayor Tom Barrett pulls off an upset win. Part of this has to with all the usual reasons why state contests should not be taken as barometers of national sentiment, as listed in a smart guest post by Will Oremus on David Weigel’s Slate blog: “1) It’s a recall. 2) It’s happening in June. 3) The incumbent is a Republican. 4) Neither Barack Obama nor Mitt Romney is running. 5) A significant number of states (49 by my count) will not be participating. 6) Need I go on?” My colleague Noam Scheiber adds an interesting conjecture on the lessons that the parties will take from the Wisconsin results about the allocation of resources this fall, arguing that a Walker win might also help the Democrats in that regard. But the fallacy of assuming that a Walker win necessarily speaks to Mitt Romney’s prospects goes deeper than that, and gets at the dynamic I observed while reporting my recent cover story on the political landscape in Ohio, another Midwestern state that has witnessed a huge battle over a controversial rookie Republican governor’s attack on collective bargaining rights. Over and over in Ohio, I heard Democratic elected officials, party strategists and unions officials noting that the improving economy in Ohio—where unemployment is now at 7.5 percent , down from 10.6 percent in late 2009—would boost Obama’s chances of holding the state this fall. But then nearly all would also concede, with varying degrees of despondency, that the improving economy was also helping Governor John Kasich climb out of the nadir of dismal public approval that he reached in the midst of his attack on collective bargaining, and would aid his odds of reelection in 2014. In essence, they said, the fates of Barack Obama and John Kasich were now to some degree linked, as incumbents in a long recovery from a deep recession. Ohio is going to be a problem for the administration…after being 48th in job creation over the past 10 years, and after losing 400,000 jobs under the previous Dem governor, we’re now outpacing everyone in the Midwest. In Feb, we were the #2 job creator in the nation – an outlier of success vs the nation at large. If Obama’s national policies are responsible for resurgent OH, why aren’t other states doing as well as us? Ohio underperformed the national economy until Gov Kasich got in 2011, and now we’re outperforming it. How does POTUS take credit for that? Now, the situation in Wisconsin is admittedly somewhat different. The recall election has truly polarized that state in a way that did not occur in the referendum over Kasich’s anti-union law, which resulted in a resounding rejection of the law. In Wisconsin, there are plenty of voters who will be casting their ballots Tuesday on ideological grounds that will, indeed, translate straight to their choice in November—whether they believe the Republican or Democratic visions for economic recovery, taxation, and spending are preferable. But there are also going to be some swing voters who are going to be voting less on those big ideological questions than on the more general question of whether things are going okay. If these swing voters believe that things are gradually coming back in Wisconsin—no sure thing, given that the jobs expansion there has been less clear than in Ohio—they may decide to vote for Walker less out of ideological solidarity than because they figure it’s foolish to rock the boat with the rare act of a recall. And here’s the thing—to the extent that Wisconsin swing voters draw that conclusion about Walker, they may also be led to support Obama’s reelection, to stick with the guy in charge. Hard as it may be to believe, there is no question these Walker/Obama voters exist—after all, the same polls that have Walker ahead of Barrett in the polls tend to also have Obama ahead of Romney, albeit by a narrowing margin. So beware the pundits who turn Tuesday’s vote into nothing but a grand partisan referendum and fail to take into account a less cable-ready way of assessing a Walker victory: as a statement of grudging pro-incumbent sentiment in a time of cautious optimism about a painfully gradual economic recovery. ..the state is known for its share of ticket-splitters, he said, and he has bumped into some people supporting Mr. Walker who may still back Mr. Obama. “There’s a slice of those Obama-Walker voters who think the recall is wrong, improper, a waste of money and an overreaction,” Mr. Ryan said. Granted, there’s some potential self-interest in this appeal to Obama supporters in a state that gave the president a huge margin of victory in 2008. But still, these swing voters exist. *Addendum II: If you still doubt whether Walker and Obama are running on the same “stay the course” message, check out what the embattled governor was saying on the trail yesterday: “A couple years ago, before I was sworn in as governor, Wisconsin lost more than 100,000 jobs. In 2009-2010, we lost more than 100,000 jobs in the state, and our unemployment rate more than 9%. That was a tough time. And instead, we tried to change things, turn stuff around, and last year, in 2011, we gained job. In 2012, we’ve already gained jobs… Since I’ve been governor, we’ve gained more than 30,000 jobs in the state. But we’re not done yet...We want to move this state forward; we don’t want to go backwards.” Hmm...sound familiar?